Understanding Betting Odds - Moneyline, Fractional Odds, Decimal Odds, etc. There are all kinds of explanations on the Internet about various odds types, and the majority of them distinguish between fractional, decimal, and moneyline odds. Unfortunately, this is misleading and mathematically speaking, incorrect. There are only two types of odds, which are unrelated to their displays as fractions, decimals or, as in America, whole numbers. Just remember those long ago school days (for some of us! )… A fraction, such as 6/5, converts into a decimal 1.2, or vice versa. Both numbers are the same, only written using different formats. Fractional and Hong Kong odds are actually exchangeable. The only difference is that the UK odds are presented as a fractional notation (e.g. 6/5) whilst the Hong Kong odds are decimal (e.g. 1.2). Both exhibit the net return. Odds commonly referred to as ‘moneyline’ are mainly US bookmakers odds and also known as American odds. Moneyline means the money wagered either to win 100 units (e.g. -400), or money which will be won from a 100 units wager (e.g. +120). However, both Indonesian and Malaysian odds, although displayed as decimals are, strictly speaking, ‘moneyline’ odds but their basis is 1 unit and not 100. 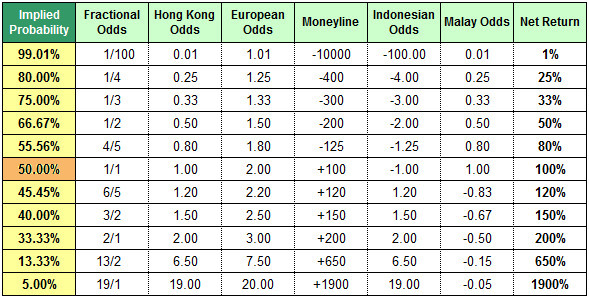 Whilst the Indonesian odds closely resemble the American moneyline odds, Malaysian odds are a kind of “inverted” Indonesian style, combined with Hong Kong odds. Although this may all sound pretty confusing, and the odds certainly look very different at first glance (see table below), just have a closer look at the above formulas – all odds are calculated using their net returns (formula for net return: 1/probability – 1) and change their formula at 50% probability (this is what is actually understood under by term ‘money-line’). Fractional odds are favoured by bookmakers in the United Kingdom and Ireland. Fractional odds quote the net return that will be paid out to the bettor, should he win, relative to his stake. Odds of 6/5 (“six-to-five”) imply that the bettor will cash £120 from a £100 stake. Should the punter win, he always receives his original stake back, plus the winnings. So, if the odds are 6/5 and the stake is £100, then the total return is £220 (£120 winnings plus the original £100 stake). Odds of 1/1 are known as ‘evens’ or ‘even money’. Not all fractional odds traditionally show the lowest common denominator. Perhaps most unusually, odds of 10/3 are read as “one-hundred-to-thirty”. Betting odds are expressed in three popular formats: fractional (British), decimal (European) and American (moneyline). These formats hold no difference in terms of final payoffs. Fractional odds are the ratio of the amount (profit) won to the stake; Decimal odds represent the amount one wins for every $1 wagered; and American odds, depending on the negative or positive sign, either indicate the amount one needs to wager to win $100 or the amount one would win for every $100 staked. So, if you are planning to enter the betting or the gambling world, it is important to understand and interpret these types of odds well.